The reason for the crash of Polish President Lech Kaczynski’s aircraft last spring near Russia’s Smolensk was the crew’s refusal to use an alternate air field for landing, despite warnings from air-traffic controllers. ­That is the main conclusion of the final report by the Intestate Aviation Committee (IAC) in charge of the investigation of the accident. Russia has already handed over the document to the Polish side. The report will be translated into Polish and then studied by Polish Interior Minister Jerzy Miller and the country’s investigative committee. After that, the Polish side will voice its stance on the document. “Throughout the flight, the crew repeatedly received information about unsatisfactory weather conditions at the destination airfield. Despite this, the Tu-154 crew did not make a decision to head for an alternate airfield. This could be considered the beginning of an emergency situation on board,” said the committee’s head, Tatiana Anodina, during a press conference on Wednesday. The deciphering of the black boxes has also revealed that the crew was under psychological pressure from the VIP passengers on board and feared the negative reaction of the president, who wanted to be on time for the Katyn Massacre commemoration events at any cost. The IAC has also concluded that the presence of the commander-in-chief of the Polish Air Force in the cockpit might have contributed to the crew's decision to land the aircraft, despite poor visibility. “He will be mad” the pilot was heard saying on the recording from the black box. It is not clear, though, to whom the phrase was addressed. The technical commission has established that, prior to take-off in Warsaw, the jet was in good order. “There was no explosion or self-destruction of the plane in the air due to collision with any obstacles,” said Tatiana Anodina. Polish Prime Minister Donald Tusk has decided to interrupt his vacation to participate in the discussion of the IAC report. 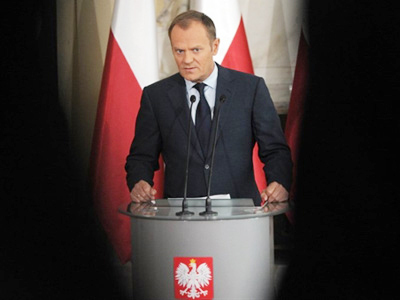 It is expected that on Thursday, Tusk will hold a news conference on the issue. Jaroslaw Kaczynski, the twin brother of the late Polish president, has criticized the report. “This is the result of Donald Tusk’s decision to let the Russians carry out the investigation. Today we’ve seen a report that accuses Polish pilots and Poland without any proof,” he told journalists on Wednesday. Edmund Klich, Poland's representative to the IAC, said that in general the report’s findings are true. At the same time, he called it incomplete and that it contained errors. 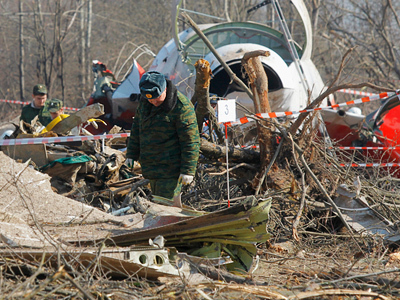 The Tu-154M plane crashed on April 10, 2010 near Russia’s Smolensk, killing all 96 people on board, including President Lech Kazcynski, his wife Maria and many of Poland’s top governmental officials, military men and parliamentarians. The official delegation was supposed to assist with commemoration events at the site of the Katyn Massacre, where thousands of Polish officers were murdered during World War II. The issue has been souring Russia-Poland relations for decades, even after 1990, when President Mikhail Gorbachev officially recognized the responsibility of the Soviet regime for those killings. The joint commemoration events due to take place last April were hailed by both Moscow and Warsaw as a turning point in their relationship, breaking ice in the long-lasting conflict. But it so happened that the commemoration led to another tragic event that brought the two nations closer together. Just after the crash, Russia established a special investigation commission and provided assistance for the relatives of those killed in the crash to travel to Russia. Ordinary Russians formed voluntary brigades to help the families of the victims with paperwork and other formalities. President Medvedev later attended the burial of the presidential couple in Poland. And this is what really seemed to break the ice, with the Polish authorities and people praising Russia’s co-operation. Still the investigation by the Russian side turned out to be a new source of misunderstanding. When preliminary proceedings at the site of the crash were completed, the twin brother of the late president, Jaroslaw Kaczynski, voiced concerns about how the investigation was being run. In October, when Moscow handed a full 200-page report of the investigators’ findings over to Poland, Polish premier Donald Tusk called it “unacceptable”. Poland then compiled a 150-page list of comments, explaining their claims and pointing out the “errors” in the Moscow probe. Jaroslaw Kaczynski added even more controversy, saying he doubted the body entombed in Krakow’s Wawel Cathedral was that of his brother.